Messian Dread invites you to download over 95% of the releases from the Dubroom studio since 1997 as well as other musical works by great artists, everything free of charge. This is the place to get the complete single collection of productions by Messian Dread and other Dubroom productions like Iriginal JAH Roots, Sure Dread and Heartical. That's not all, though: we have Alpha and Omega, we have Prince Fatty, to name to UK based names. Just like our Net Albums, there's quite a bit of material not just available for free MP3 download but also in true CD Quality Wave Audio. WWW, November 2014 - The urban, futuristic atmosphere of this release is depicted in the art work that comes with it. Over ten minutes of deep Dub created from two brand new original Dubroom riddims: here is Dub Whyze! In many ways, this release marks the beginning of yet another change in the Dubroom's studio. With the recent arrival of Propellerhead's Reason 8.0 music production software and the Dubroom's in-depth coverage of the Digital Audio Workstation (DAW) came changes for the way the music is actually produced. Those who follow the Dubroom recently will have noticed all this coverage as it was the sole focus of the Dubroom throughout the months October and November in this 2014. 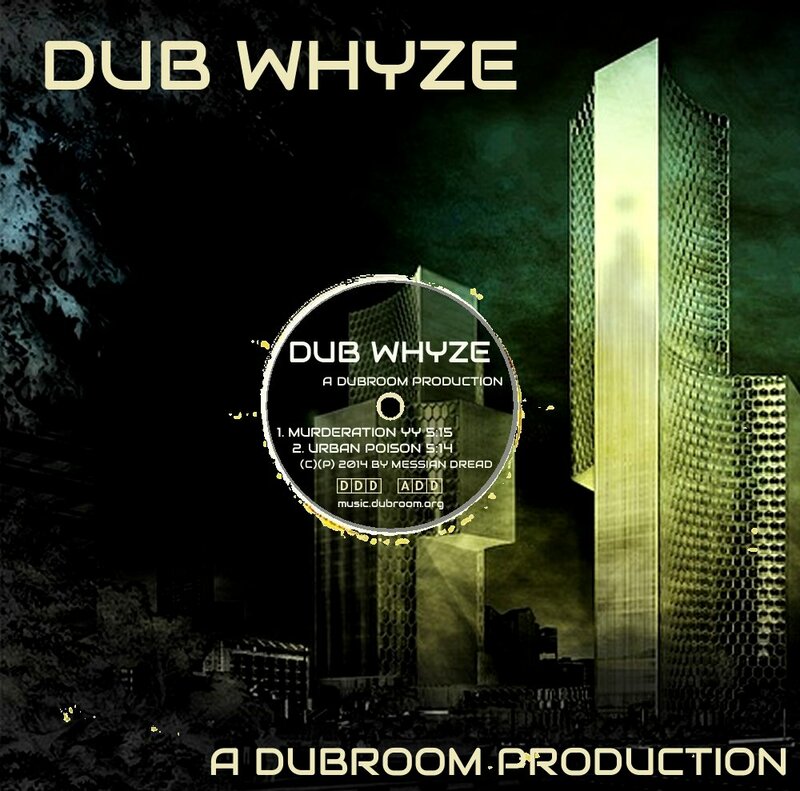 Several tracks have been created and put on You Tube as part of this coverage, but Dub Whyze is the first official release from the Dubroom's Net Label. Both tracks have an effect on the vocals that is, to say the least, highly controversial. It works on the vocal and gives it a different melody. The effect is called "Auto Tune" and much is said about it. Some claim it can turn the worst voice into the best singer but that's not the way it's used in this release. As with everything in Dub, effects are there to be noticed and not to cover up anything. Love it or like it, but the effect does give a special vibe to the overall mix and in itself justifies the cover art. No need for any further tech-know? Here's two tracks for your musical pleasure. The tempo is slow, drum and bass lay down a heavy line: When You Hear This One It's Serious. From start to end, that is. In a cool and dreadly pace that should not be underestimated. Horns, guitars and other instruments drop in and out as they get totally transformed by the multitude of effects and detailed mixing work. A Dub with a deeper meaning for real. The city without pity. For a dread it can be hard to dwell in it. Keeping your roots and culture where they should be is often made impossible by a multitude of rules, regulations and repression. That's what this track is all about. A steppers drum with a bassline that says a thing or two, instruments and echo's get splattered into a million pieces like breaking glass: another hard hitting Dub from the Dubroom studio and net label. Please do not re-publish the actual music, because unlike Dubroom releases before 2014, this release is © Messian Dread/Dubroom. Available for free: 128 Kbps/320 Kbps MP3 Files, CD Quality Wave Audio.